Cleft Lip Surgery in NYC | Nicholas Bastidas, M.D. If your baby has a cleft lip, entrust them to Nicholas Bastidas, M.D., for expert and compassionate care in NYC. Our experienced, gentle team can correct the problem and ensure that your infant has the best chance to thrive as they grow. 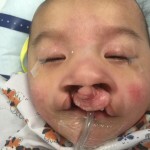 A cleft lip is a common birth condition. Due to random chance in fetal development, some infants are born with a gap or two in their upper lip. This happens when the tissues in a baby’s face don’t fuse properly when they develop in the womb. Cleft lips can be surprising to look at, but they mainly pose a problem because they inhibit children’s growth, making feeding and speech development difficult. Cleft lips also make children more likely to suffer from ear infections and hearing issues. Consequently, these babies need cleft lip surgery early on so they can thrive. Cleft lip surgery generally happens when a baby is about three or four months old. While many parents are nervous about their newborn undergoing surgery at such a tender age, rest assured that Dr. Bastidas and his team have extensive experience and will do everything possible to keep your baby safe and comfortable. We’ll work with you so you know exactly what’s going on and what to expect. Generally, cleft lip surgery is extremely simple. It will take about two hours, and you’ll be able to bring your baby home that same day instead of staying overnight. While sometimes cleft lips aren’t apparent until birth, some babies are diagnosed with them before birth via ultrasound. As soon as you know your baby may have a cleft lip, our experienced team will work with you to help your child. We offer training on feeding for babies with cleft palates, and we’ll coordinate any care your child might need before and after surgery, including checkups throughout childhood to make sure your child’s face develops properly. For compassionate, state-of-the-art care for your child, call Nicholas Bastidas, M.D. Schedule an appointment at our New York, NY, office at (212) 485-0616.